Many types of businesses easily qualify for a Merchant Cash Advance. While everybody says about their products, in this case, it is honestly true…we have always had an extremely high percentage of our applicants qualify. Why? Simply put, it is because we are able to evaluate risk differently than other financial providers. The main requirements of a Merchant Cash Advance applicant are to own a business and to process credit card sales. Each Merchant Cash Advance provider will have additional requirements, usually centered on the business’ operations. Most small business owners will find the qualifications of a Merchant Cash Advance much easier to meet than the requirements associated with traditional financing options. That’s what small business owners are telling us—that they appreciate less hassle, less paperwork, and the fact that Merchant Cash Advances are more flexible and responsive than traditional options. 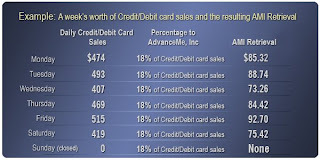 So in general, businesses that accept a specified amount of credit and debit card sales are the ones that qualify. This means they might be restaurants, retail shops, florists, spas, salons, dental or medical offices, or any number of small business types. Some will be franchises, some will be multi-unit enterprises and some will be single Mom-and-Pop establishments. It could be almost any business in almost any industry. Like us, most reputable Merchant Cash Advance providers will review some measurable variables that tell them more about you and how your business works. Common things for most providers (including us) to review are the time in business, current status with a landlord, the average credit card activity for 4-12 months, and the status of other current financial obligations. These variables, in large part, determine the specifics of each deal. The short answer is yes, your credit score always matters. The better your credit score is, the wider the range of financial opportunities offered to you and your business. But read on. With a Merchant Cash Advance, your credit score will matter significantly less than it would if you were to apply for a loan. It is one characteristic of a Merchant Cash Advance that many business owners have said that they really appreciate. We have approved merchants with credit scores as low as 411, and a significant percentage of our merchants have credit scores greater than 650. Does this mean everyone who applies gets approved? No. But many who do apply will get approved…and almost all of these qualified applicants will have less than perfect credit scores. While the credit score of each applicant is reviewed as part of our process, it is not very often going to be the sole hurdle. We have helped lots of people with bad credit scores and lots of people with good credit scores. We handle each case on an individual basis. Our ability to analyze and assess the unique risks of each specific application allows us to look beyond a credit score. Still have questions? Just ask. The key to making better business decisions is to know all you can about your opportunities. This forum is designed to help you understand all you can about a Merchant Cash Advance, and help you determine if this is a financial option that makes sense for your small business. If we haven’t addressed your own questions yet, feel free to send them on. Previous posts have covered What a Merchant Cash Advance is, How a Merchant Cash Advance works, which contains an illustration of a Merchant Cash Advance. To create a real world illustration of how a Merchant Cash Advance works, let’s say you have a restaurant. Your restaurant needs $15,000 for remodeling, and you qualify for a $15,000 Merchant Cash Advance to handle the remodeling costs. To get this money, you would sell the Merchant Cash Advance provider the right to receive a set amount of your future credit card sales – for this illustration, let’s say $20,000. So you sell $20,000 worth of future credit card sales to receive the $15,000 you need right now. Basically speaking, the $5,000 difference is the cost of the money, which goes to the Merchant Cash Advance provider (*please note, the actual amount going to the provider varies, but it is always clearly established in the terms of a deal). Once you agree with the provider’s terms, shake hands, sign the papers, and it’s done. You’d get the $15,000 within days and be set up to automatically handle everything with your provider (via your processor). Sometimes this means switching processors to one that has an existing partnership with your provider. If this switch is necessary it can be handled quickly, and depending on the circumstances, may even offer additional benefits to you and your business. From here, it is really easy. Your business would continue to handle business as usual. The only difference now is that when you run a batch on your credit card activity, a fixed percentage of it will be forwarded to the Merchant Cash Advance provider. This continues until the full amount you promised to pay the cash provider is delivered. So let’s say the agreement calls for you to forward 18% of your batches until the Merchant Cash Advance provider has received all $20,000(*please note, the actual percentage varies, but it is always clearly established in the terms of a deal). You run a batch report on Monday and see that you have processed $1560 in credit and debit card sales over the weekend. 18% of this is $280.80, so this amount ($280.80) is automatically forwarded to the provider. It reduces the amount of future credit card receipts you owe to $19,719.20. You did nothing different—it was business as usual. Now, however, your credit card processor adjusts your batches to send your provider a fixed percentage until your obligation is fully met. Does this mean every forwarded amount will be $280.80? These transactions will occur every time you batch your credit and debit card sales until your obligation is met in full. Once this point is reached, the provider immediately stops receiving anything from your batches. And that is the bare-bone basics of a Merchant Cash Advance from start to finish. 2. You sell a dollar amount of your future credit and debit card sales in exchange for a lump sum of cash. 3. You make sure the processing and paperwork is addressed, and then you receive your money. 4. You spend it on any business purpose. 5. You continue business as usual. As you batch credit and debit card sales, a fixed percentage is forwarded to the provider through the credit card processor. Once you’ve met your obligation, collection stops automatically. To keep this easy to digest, let’s stop here. Ours is a unique approach if you are unfamiliar with it, so it sometimes takes a little while to let it all sink in. No rush…that is why we started this blog. To relax, and get a better understanding of what this is, and how it works. We have also recently developed a simple Flash explanation of what an MCA is and How It Works. As always, your response is encouraged. A Merchant Cash Advance is a flexible alternative to traditional small business financing. It might also be called credit card receivable funding, credit card factoring or a business cash advance, depending on the provider or the person or forum talking about the product. While this might be called many things, a Merchant Cash Advance is the most common reference to this funding product. In a nutshell, a Merchant Cash Advance is a really unique funding product allowing small business owners to access working capital now by selling their future credit card sales. A Merchant Cash Advance is unique, but it is not hard to understand. If your business accepts credit cards, you might be able to use your future sales to access working capital. A Merchant Cash Advance is not a loan. It is a purchase and sale…customers sell Merchant Cash Advance providers a portion of their future credit and signature-based debit card sales in exchange for immediate access to business capital. This is a financial option that can offer many advantages to a small business owner. You can spend the money for any business purpose. You don’t need personal collateral. There are no checks to write. Everything is automatically handled by the credit card processor. You pay back the balance by processing regular credit and signature-based debit card sales. It is quick and easy when compared to other financial options. Perhaps the most unique benefit is that there is no set maturity date, no pre-set payment amount. The amount collected aligns with your business’ credit card sales. The more you earn, the higher the payment amount. During slower periods, the amount declines. Do you know of any other financial obligation that aligns payment amounts with your sales volume? Does your landlord decrease your rent because sales are down this month? Does your bank adjust your loan payment to match your business’ seasonality? No. So you can see how using the flexible structure of a Merchant Cash Advance can be used to help manage your business’ cash flow. Confused? Don’t be—it is really very simple. In our next post, we will create a real world illustration to help make it as clear as possible. In the meantime, if you have any questions we can answer feel free to post them here. This is a blog about Merchant Cash Advances for Small Business Owners. Being in the business of alternative funding, we’d like to think that everyone knows what a Merchant Cash Advance is and how it works. But feedback from our sales teams, the media, alliance partners and the thousands of small business owners that we deal with every week indicates otherwise. There is still a lack of awareness, knowledge and understanding about a Merchant Cash Advance. This is causing confusion about the basics of the product, its pros and cons, and how it can help (or why it could hurt) small business owners. It seems that there is a gap between what many business owners believe or expect and the reality of what this is, and how it works. Seems like a perfect reason for us to start this blog…to open up the lines of communication to close that gap. Offering more information about financial options seems especially pertinent during these turbulent economic times, as the “credit crunch” continues to limit access to money for consumers and business owners. Why this blog is here. Our purpose in writing this blog is to inform. We will be providing complete information, delivered in a simple, straightforward manner. We’ll use an open discussion forum so that readers can benefit from multiple perspectives. Our goal is helping them better understand the various aspects of Merchant Cash Advances and how the small business community is using this “working capital alternative” to its greatest advantage. The issues discussed in this blog will focus on improving a business owner’s total understanding of what a Merchant Cash Advance is, what it does, and how it can help his or her business. To balance the scales, we will also discuss under what circumstances a Merchant Cash Advance may not be the right alternative, and why. Other important issues facing small businesses might also be discussed in this blog. Topics will be offered, but we invite your suggestions and/or questions. Feedback is definitely welcomed and encouraged.